After battling back to tie the game at 6-6 in the 8th inning, the Duke baseball team lost in 12 innings to host UNC-Greensboro, 9-8. The Blue Devils actually led 3-1, but a UNC-G five run 4th inning put them ahead. They retook the lead in the top of the 12th on a Jordan Betts RBI single with two outs (he went 3-for-7 with two runs scored and two RBIs). Their second run came via an error. After the Duke bullpen put up seven scoreless innings,Andrew Istler entered in the 12th to pick up the save. He struck out the first batter he faced but an error opened the door. After back-to-back singles, Istler recorded another strikeout (that would have ended the game). Instead,Hunter King delivered an RBI single before Julian Abreu followed with the walk off two-run single. King andAbreu, the UNC-G 2-3 hitters, went a combined 6-for-14 with five RBIs. Drew Van Orden got the start after pitching an inning of relief over the weekend. He allowed five runs on five hits, two walks, and a hit batter over 3.1 innings. Van Orden left with the bases loaded in the fourth with one run already in and all three scored. Robert Huber pitched two more scoreless innings of relief. Conner Stevens continued his dominating start to the 2014 season, as he followed with two more scoreless innings of relief. He did not allow a baserunner while striking out three. He brought the tie game into the 12th. On offense for Duke, Chris Marconcini went a perfect 4-for-4 with two walks. He also scored three runs and drove in two. Mike Rosenfeld and Mark Lumpa each collected two hits in the loss. Both also walked twice. 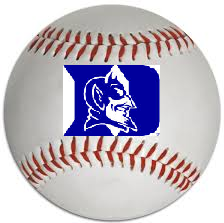 Duke returns home to host the Duke Baseball Classic this weekend. They will welcome LaSalle, Saint Louis, and Akron to Durham. *In other baseball news, starter Michael Matuella was named the ACC Pitcher of the Weekfor the first time. In the second game of Saturday’s doubleheader against Binghamton,Matuella threw five perfect innings in his first start of the 2014 season. The right-hander struck out a career-high nine.